The dinosaurs on Isla Nublar are threatened with extinction by the imminent eruption of a volcano. I recall hearing an anecdote concerning a society of pranksters in 1970s London who would take trips en masse to the cinema, only to walk out when or if the title of the movie in question was spoken by a character. That lot would get their money's worth with Jurassic World: Fallen Kingdom, as it's not until the closing minutes that a returning original cast member (in a blink and you'll miss it cameo) informs us that we're now living in a "Jurassic World." It's the sort of cringeworthy moment that would normally cause me to groan, but I was so broken down by the laziness and ineptitude of this fifth instalment in the franchise that I couldn't even muster a sigh by that late point. Owen and Claire, the one-dimensional heroes played by Chris Pratt and Bryce Dallas Howard, return for this followup to the 2015 reboot, but they've been stripped of that singular dimension and now resemble husks of the non-characters they once were. All Pratt's Owen had going for him in Jurassic World was his cheeky chauvinism, but fearing a backlash from the sort of people who get offended by one-note characters in monster movies, the filmmakers have decided to excise his sexism, leaving a wax dummy in his place. At one point Owen is shot by a tranquiliser dart and a baddie knocks him over by simply blowing in his direction, a knowing acknowledgement from the film as to how paper thin he is. All I can recall of Howard's Claire from the previous film was her penchant for fleeing from rampaging dinos while wearing heels. Thanks to the mocking from the internet over that incident of impracticality (in a movie about a theme park filled with formerly extinct dinosaurs), the heels are gone, and with them her one defining quality. The remaining cardboard shells of Owen and Claire find themselves back on Isla Nublar in an attempt to save the dinos from an imminent volcanic eruption. There are a lot of dumb details in Fallen Kingdom, but retroactively making Spielberg's original equally dumb by association and having us believe Richard Attenborough was thick enough to build a theme park next to a volcano is the most insulting of the lot. Accompanying Owen and Claire on the expedition are a bunch of generic mercenaries (why do these guys always have cockney accents?) who it turns out want to get the dinos off the island for a far less benevolent reason than our heroes. Why did they bring Owen and Claire along in the first place? Well, we're told initially it's because Owen is the only person who can track and capture 'Blue', the intelligent velociraptor, but a later revelation makes this null and void, meaning acceptance of the entire central premise relies on overlooking a plothole wide enough for a T-Rex to stumble into. As is the way of the modern blockbuster, there's a lot of plot exposition to get through before the inevitable overlong climactic set-piece, which in this case seems inspired by those found in Roger Moore era James Bond movies, our heroes battling their way through a crumbling complex, thanks to the villain refusing to kill them when he had a chance. Of course there are dinosaurs on the loose, but it's difficult to think of them as a threat when prior to that point the movie has spent so much energy getting us to sympathise with them. The film's most effective moment is a prolonged sequence in which we're left to watch a dinosaur die a slow death as it's engulfed by lava. From then on it's impossible to view the creatures as the malevolent eating machines the climax requires them to be seen as, especially when they've spent much of their time loafing around amiably like the gratuitous beasts added into the backgrounds of the remastered Star Wars movies by a bored George Lucas. In the 1993 film we shat ourselves any time a character came within a mile of a T-Rex; here Claire finds herself riding one like a bull in a 'comic' moment. You see it's the humans who are the real villains in Fallen Kingdom, except they're not remotely threatening either, and for the most part we don't even get the satisfaction of watching them die horrible deaths at the hands of the dinos. 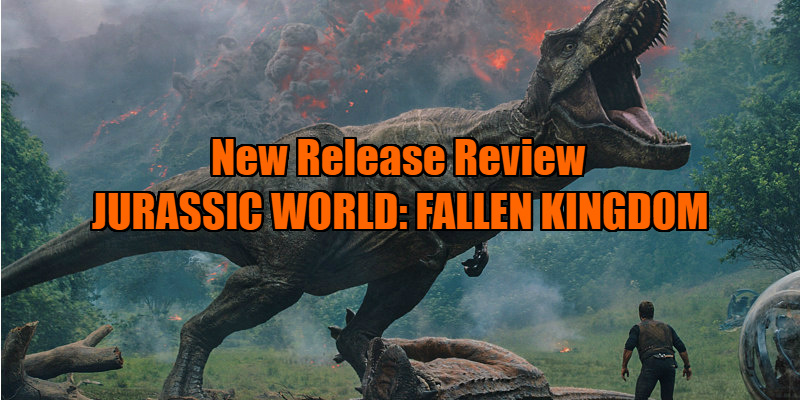 Fallen Kingdom suffers from a severe lack of expendable characters, and no matter how many monsters it throws in the path of Owen and Claire, the stakes remain remarkably low. Even the shockingly apocalyptic in its implications ending carries no real weight, especially when it's immediately followed by John Williams' upbeat theme. You have to feel for J.A. Bayona, one of the most talented directors working in mainstream cinema today. There are brief glimpses of his brilliance to be found as he employs light and shadow to good effect and pulls off a 'how did they do that?' single take underwater sequence, but the script is a turd no filmmaker could successfully polish. A reliance on telling over showing dogs the film, like how we're told the brand new dinosaur creation, the 'Indo-Raptor', is the most intelligent and deadly dino ever created, only for the film to never subsequently show us anything that comes close to backing up this claim. 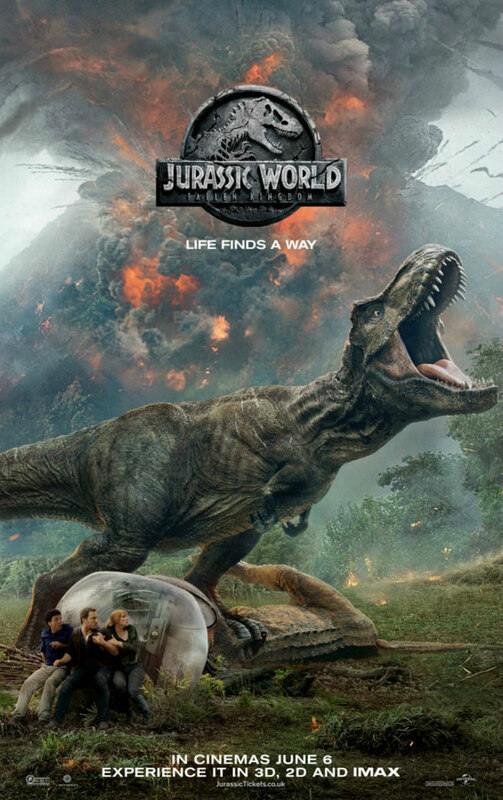 It just looks like a small T-Rex to my eyes, and in one of the more ridiculous moments of a very ridiculous movie, it fails to muster the strength to break through the thin balsa wood door a character seeks refuge behind. Could this be an analogy for contemporary Hollywood, which has been telling us its product is getting bigger and better all the time with very little evidence to back up such boasts? Jurassic World: Fallen Kingdom is in UK/ROI cinemas June 6th.